Hello! I assume most of you already know me, but in case you don’t, my name is Brie and I’ve been reviewing romance novels for the past eight* years on my (now old) blog, Romance Around the Corner, and other places such as Heroes & Heartbreakers (RIP)**. When I started my original site, I didn’t know what I was doing, but I knew that I wanted to be an active member of a community that had given me a lot of joy. It was a wonderful journey that made me a better reader and introduced me to amazing people, many of whom I now call friends and all of whom I deeply admire. But burnout happens and reviewing takes energy that I simply didn’t have anymore, and yet, I kept thinking to myself that I was just taking a break, even when the months kept piling on. I love blogging and I didn’t want to say goodbye to it, but the thought of writing reviews under the same format felt draining and exhausting until I realized that what I really wanted to do was talk about books and the genre without the constrictions of what I think of as a review. With that realization came the idea that maybe I needed a clean break and perhaps even a different set of constrictions that would feel freeing rather than limiting. I think Romance Around the Corner could fit into what I want to do now, since it’s not really that far from what I was already doing there, but a fresh start is the emotional unloading that I desperately needed, and it makes me happier and more energized than I’ve been in years. 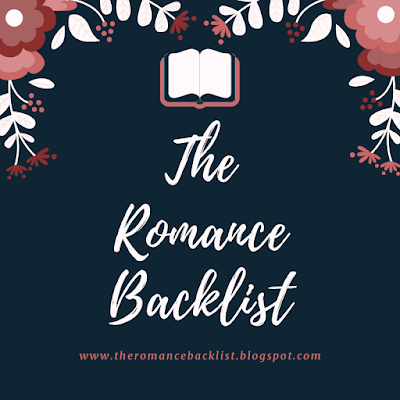 So, The Romance Backlist will be a book blog about Romance novels, and it will still mostly feature reviews, but they won’t be as structured (no more plot recaps unless strictly necessary!) and I will try to use each article to take a look at either the big picture in terms of genre or to just take a closer look at what the books are doing with Romance. Sometimes the posts will be good old regular reviews, and sometimes I’ll pick a couple of books and contextualize them while examining their similarities, differences, and what they owe to each other and the genre. I'd like to talk about individual tropes and past trends. I have lots of plans and ideas, some of which I’ve been thinking about for literally years. What I won’t be doing is reviewing new and upcoming releases. The biggest burden, to me, was this need to stay on top of everything that was being published and all the books generating hype. That urge to be part of the conversation turned into a lot of pressure and made me forget that it wasn’t the conversation, but a conversation, and since I firmly believe that there is an audience for book talk regardless of titles and publication dates, I want to get rid of the anxiety and negative feelings I had attached to that aspect of book blogging. That doesn’t mean that I won’t be reading new books, but I won’t be talking about them here. So, the rule I’ve set up is that I will only feature books that are at least a year old, which in theory doesn’t sound like much, but feels quite long when I look at how fast the romance publishing rate is. The most important is that I want this to be an inclusive site that highlights and features diverse voices. I’m aware of how white/cis/straight my reading list has been, and I need to do much better. I want to do a better job at promoting the blog and not be embarrassed if I tweet a link more than once. I want to signal-boost and support the blogs I love—the ones I’ve been reading since before I had my own, and the newer ones doing such an amazing job. Engagement is important and rewarding for both reader and blogger, and I can worry all day about what’s happening to romance blogs and websites, but if I don’t actually read, comment, and spread the word about them, do I really have to wonder what's happening? And I want to talk about books on twitter more, which is where I’ll be mentioning recent releases, because there’s a robust, insightful conversation taking place daily, and I want to contribute more. And, you know, I already spend a lot of time on twitter, so it’s not as if I haven't already given myself away to the social media gods. That’s it! I hope you join me in this new journey, and I really, really hope I make it or else all the time I spent yelling at Blogger will go to waste, and who wants that?! Not me! Just do it for all the chores I neglected while I was building this thing. The first post will go live next month, but in the meantime you can follow the blog's Twitter feed here or follow me directly....or both! I do like the attention. * You better believe I’m also counting the year I wasn’t active! **It was just H&H (RIP), but let’s just pretend that I was all over Romancelandia and everyone knows me, so that my inflated sense of self-importance isn't threatened by facts. I am here. Ready for it.